One of the first realizations that I was stepping (pun intended) into the corporate, professional world this past September was that I had to place these somewhat foreign objects on my feet everyday. Calf straining, toe-crunching, sweat breeding objects. No flip flops allowed. Ouch. I was so nervous those first few weeks. Ten minutes before start time there I was in the parking lot fiddling maniacally with the straps of a pair of heels I bought at a second-hand store. The rubber inserts were peeling off and I had to constantly reattach them. My work clothes consisted of a few outfits from said thrift store and a sprinkling hodgepodge of items I put together from my own closet. Items I hoped did not show too much back or leg, or resembled a wardrobe from Gilligan’s Island/Punky Brewster/The O.C. Surely these people knew I was a fraud. I’m a writer, a beach bum, a stay-at-home Mom. A girl who sometimes doesn’t get out of her jammies until late afternoon. A girl who loves flip flops so much she fashioned a blog after them. I staggered across the parking lot hoping I didn’t look drunk. Like a fawn trying to get her footing after being in the cozy sheltered womb. I smiled as I passed my business casual-clad coworkers. Hiding my grimace from the pain of the shoes, the claustrophobia of the underwear. Hoping I at least looked the part. Four months have passed. I still stagger from time to time. Ok, often. And I still drive to work in flip flops. But I am not alone. There are others who suffer from flip flop separation. We slip our heels and toe-covering flats off while sitting at our desk. Our foot-coverings of choice stashed on the floor boards of our cars, waiting to be reunited. We may work in heels, but we walk in flip flops. 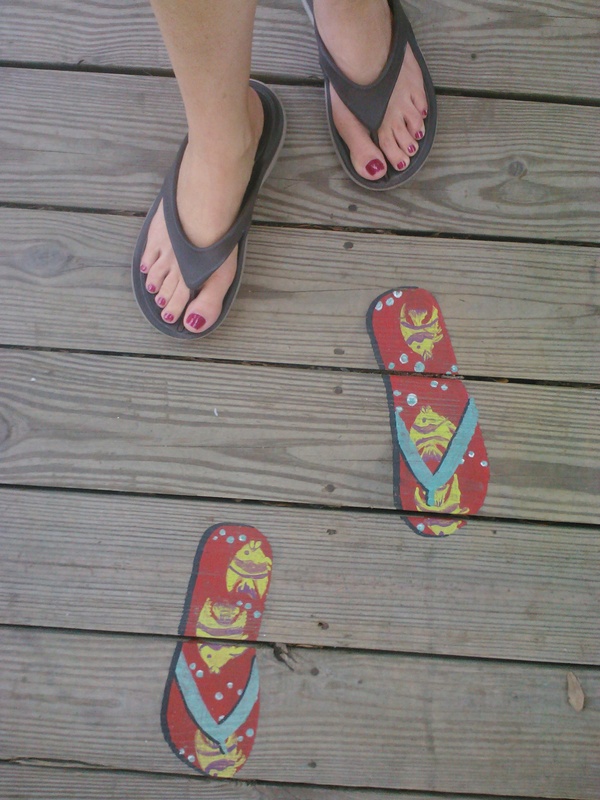 Funny how we Floridians have kept our on going romance with the Flip-flop!Growing up semi-poor we always had a couple pair for everyday playing after school and weekends. As an adult I lean toward the prettier ones as I dont like big ugly clod-hopper flip flops. I hate them on men. I realize most people love them. They are some what of a staple for most warm weather friends. I enjoyed reading your blog today and love you to pieces! Thank you so much Normie. I miss you! I actually like flip flops on men. But only if they have purty feet. That goes for women, too. Ah-h, corporate life in Florida. Here in Santa Fe, there is no corporate. And flip flops only expose toes to frostbite, until April that is. Flip on, Jenifer. Where are you? How are you? Hope you’re well and we’ll see you back writing again soon. I’m still alive! Funny right when you wrote this I was about to finally publish a post. Connected through the blogosphere… Thank you so much for being here!